When Revealed: Put the top enemy in the encounter discard pile into play, engaged with the first player. If this effect put no enemies into play, Chance Encounter gains surge. When Revealed: If the players are not on stage 1, shuffle the current quest card into the quest deck, then reveal a new quest card. Otherwise, New Devilry gains surge. Shadow: If this attack is undefended, raise your threat by The Nameless Fear's Threat. When Revealed: Return the top 2 Snow cards in the encounter discard pile to the top of the encounter deck. If this effect returned less than 2 Snow treachery cards, Fell Voices gains surge. 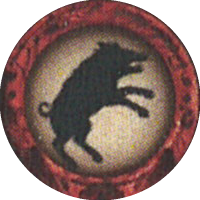 When Revealed: The first player (choose 1): deals 1 damage to all allies in play and Followed by Night gains surge, or all enemies engaged with players make an immediate attack, if able. When Revealed: Each player must discard 1 ally he controls, if able. If Fires in the Deep discarded no allies, it gains surge. Shadow: The defending player discards 1 ally he controls, if able. When Revealed: Return all Brigand enemies engaged with players to the staging area. If this effect returned no Brigand enemies to the staging area, Lurking in Shadows gains surge. Shadow: Each player raises his threat by the number of enemies engaged with him. When Revealed: Randomly select 1 ally controlled by the first player, if able. The first player deals X damage to one of his heroes, where X is that ally's Attack. Then discard that ally. If no ally is discarded by this effect, A Knife in the Back gains surge. When Revealed: Discard 1 villager token from the active location for each player in the game. If no villager tokens were removed by this effect, Trapped Inside gains surge. 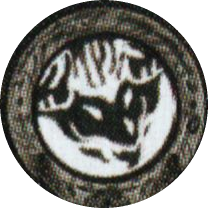 When Revealed: Each player must take a villager token from Rescued Villagers and place it on a location in the staging area, if able. If no villager tokens were placed on a location by this effect, Panicked! gains surge. 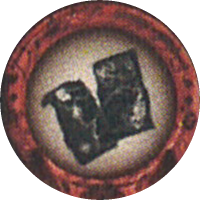 Shadow: Attacking enemy gets +1 Attack for each damage token on Dead Villagers. When Revealed: Until the end of the phase, Orc enemies engaged with players add their Threat to the staging area. 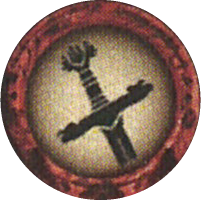 If no Orc enemies are engaged with players, Conflict at the Crossroads gains surge. When Revealed: Raise each players' threat by the number of progress tokens on To the Tower. If there are no progress tokens on To the Tower, The Dead City Looms gains surge. 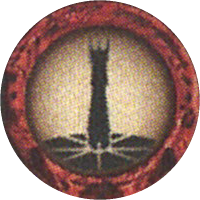 Shadow: Attacking enemy gets +1 Attack for each progress token on To the Tower. When Revealed: Each player draws a card. Each player discard each ally from his hand. If no allies were discarded this way, Frenzied Attack gains surge. Shadow: Attacking enemy gets +1 AQttack for each Key objective the players control. When Revealed: Each player raises his threat by 1 for each ally he controls. Then, if any player's threat is 20 or less, this card gains surge. Shadow: Attacking enemy gets +1 Attack. (+2 Attack instead if the defending player's threat is 20 or less). When Revealed: Place 3 damage on the active location. If there is no active location, Desecrated Ruins gains surge. Shadow: Attacking enemy gets +1 Attack. If this attack destroys an ally, place X damage on the active location. X is that ally's cost. When Revealed: Each player must exhaust X characters he controls. X is the number of cards underneath The Orcs' Search. If no characters are exhausted this way, Spies from Mordor gains surge. Shadow: Defending player discards a non-objective attachment he controls. When Revealed: Remove 1 time counter from each location in play. Place X time counters on each location in play with no time counters on it. X is the "Time X" value on that location. If there are not locations in the staging area, Raising the Cry gains surge. Shadow: Attacking enemy gets +1 Attack. Return attacking enemy to the staging area after this attack. When Revealed: Each Undead enemy gets +1 Threat, +1 Attack, and +1 Defense until the end of the round. If there are no Undead enemies in play, Restless Evil gains surge. Shadow: Each Undead enemy engaged with you gets +1 Attack and +1 Defense until the end of the round. When Revealed: Deal 1 damage to each Aflame location in play. If less than 3 total damage is dealt by this effect, The Fires Spread gains surge. Shadow: If this attack destroys a character, deal 1 damage to each Aflame location in play. 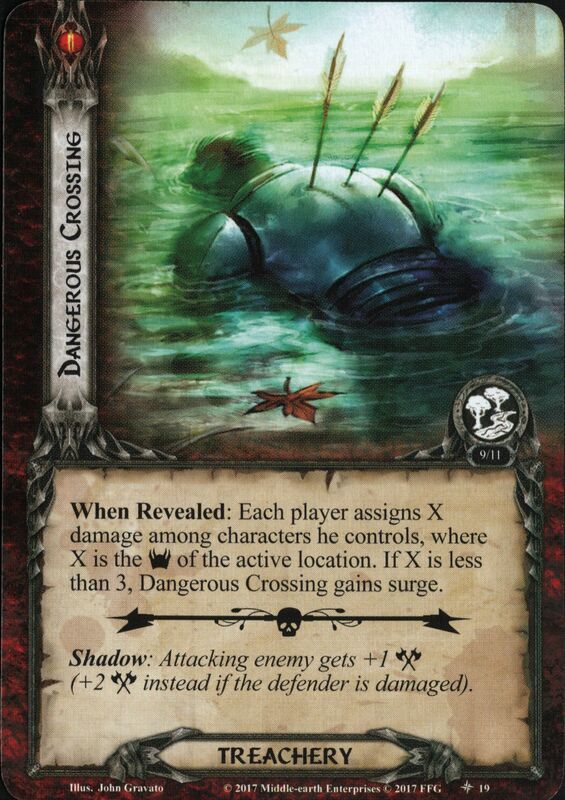 Shadow: If the active location is Underwater, search the encounter deck and discard pile for a Creature enemy, and add it to the staging area. When Revealed: Choose a Ship enemy that is not currently guarding an objective. Attach that enemy to an unguarded objective in the staging area, guarding it (return that enemy to the staging area if it is engaged). If no Ship enemy is returned to the staging area by this effect, The Raiders' Assault gains surge. When Revealed: Add 2 resources to a Raider enemy in the staging area. Each Raider enemy in the staging area gets +1 Threat for each resource on it until the end of the phase. If there are no Raider enemies in the staging area, Foes of Ecthelion gains surge. When Revealed: Add 1 resource to each engaged Raider enemy. Then, each player assigns damage among characters he controls equal to the number of resource tokens on Raider enemies engaged with him. If no damage is assigned by this effect, Fury and Malice gains surge. When Revealed: Add Uruk Pursuer to the Orc's area. 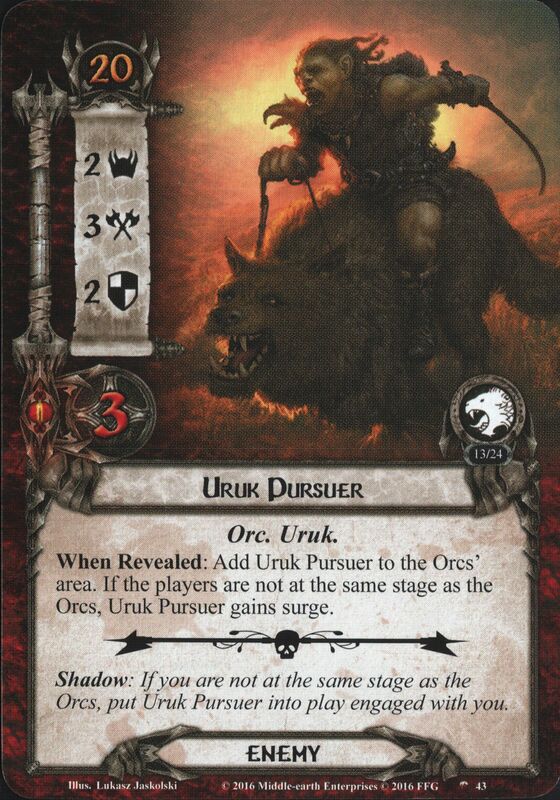 If the players are not at the same stage as the Orcs, Uruk Pursuer gains surge. 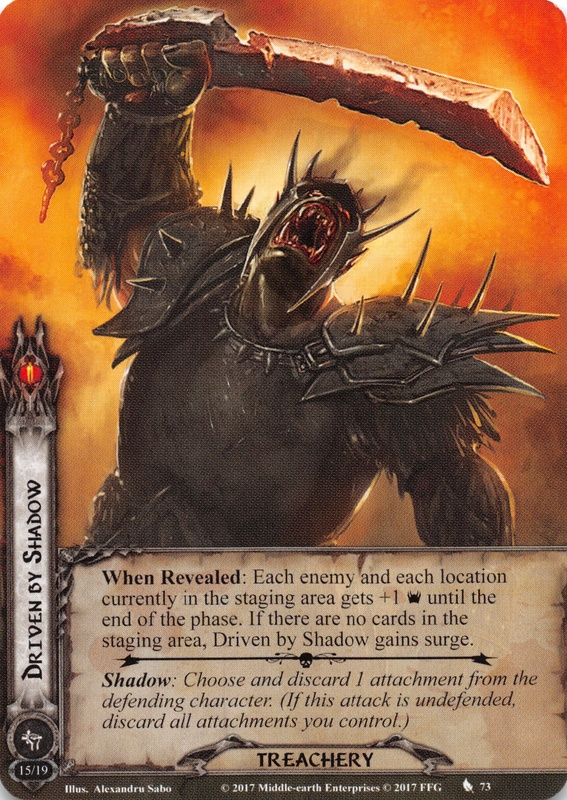 Shadow: If the players are not at the same stage as the Orcs, put Uruk Pursuer into play engaged with you. While On Track is in play, Spider Broodling gains surge. 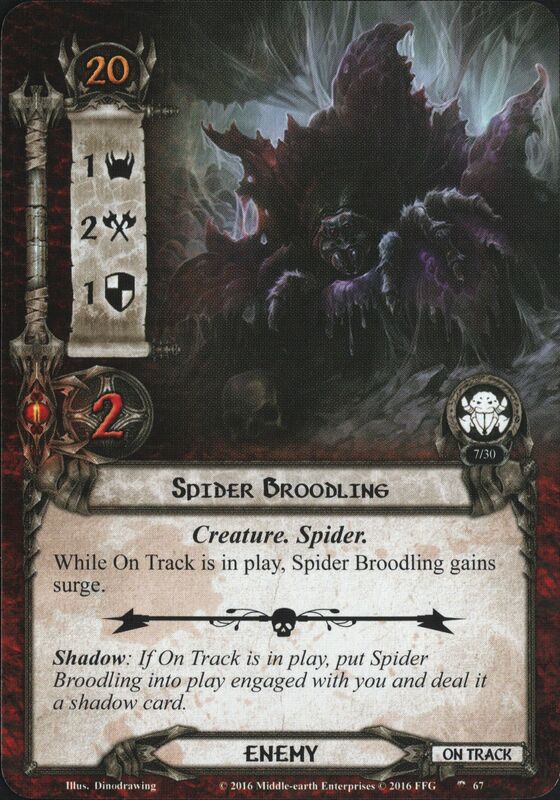 Shadow: If On Track is in play, put Spider Broodling into play engaged with you and deal it a shadow card. When Revealed: Each player raises his threat by 1 for each guarded objective he owns. If any player does not own a guarded objective, Tormented by Orcs gains surge. Shadow: Until the end of the phase, attacking enemy gets +1 Defense (+2 Defense instead if it is guarding an objective). 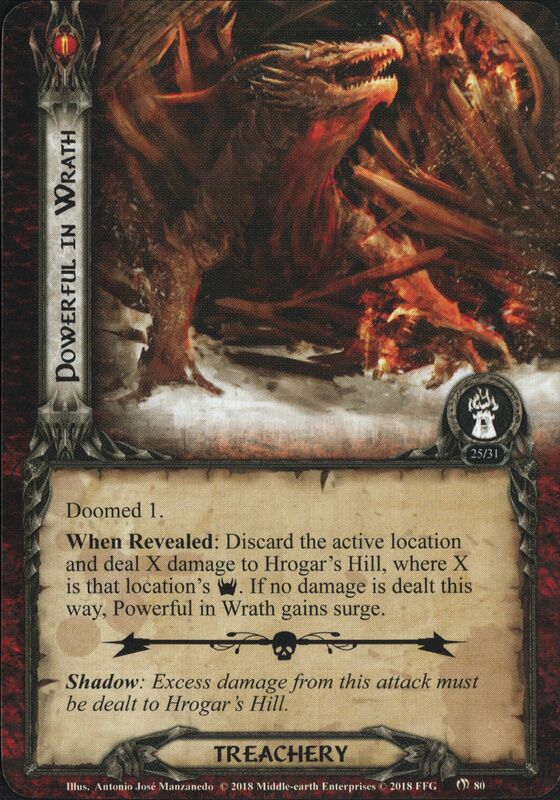 When Revealed: Discard the active location and deal X damage to Hrogar’s Hill, where X is that location’s [Threat]. If no damage is dealt this way, Powerful in Wraith gains surge. Shadow: Excess damage from this attack must be dealt to Hrogar's Hill. When Revealed: Each player resolves the Discover keyword of the active location in turn order. 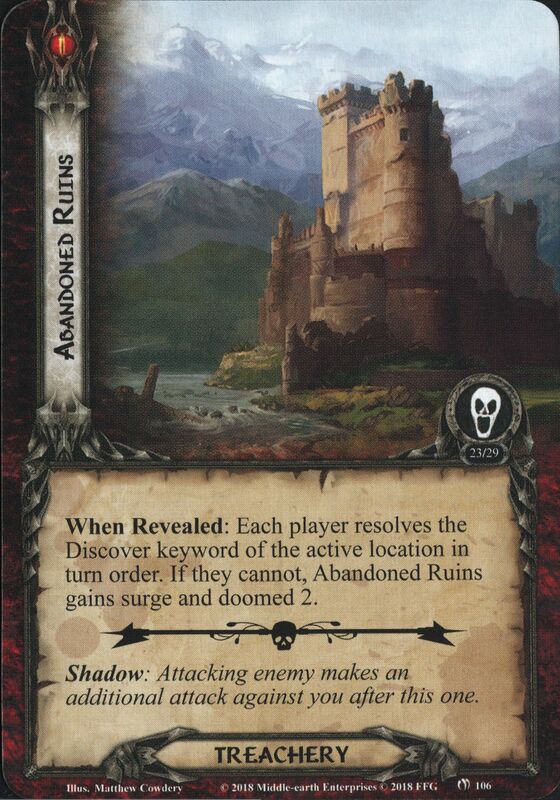 If they cannot, Abandoned Ruins gains surge and doomed 2. When Revealed: Attach to the active location. (Countss as a Condition attachment with the text, "Limit 1 per location. No more than 3 progress can be placed on attached location each round.") If Snowdrifts is not attached to the active location, it gains surge. When Revealed: Trigger the Wizardry effect on the active location. If no Wizardry effect is triggered this way, Machines of Isengard gains surge. Shadow: Attacking enemy gets +1 Attack. If this attack destroys a character, discard 1 random card from your hand. When Revealed: Deal 1 damage to each enemy in the staging area. Until the end of the phase, each enemy gets +1 Threat for each damage on it. 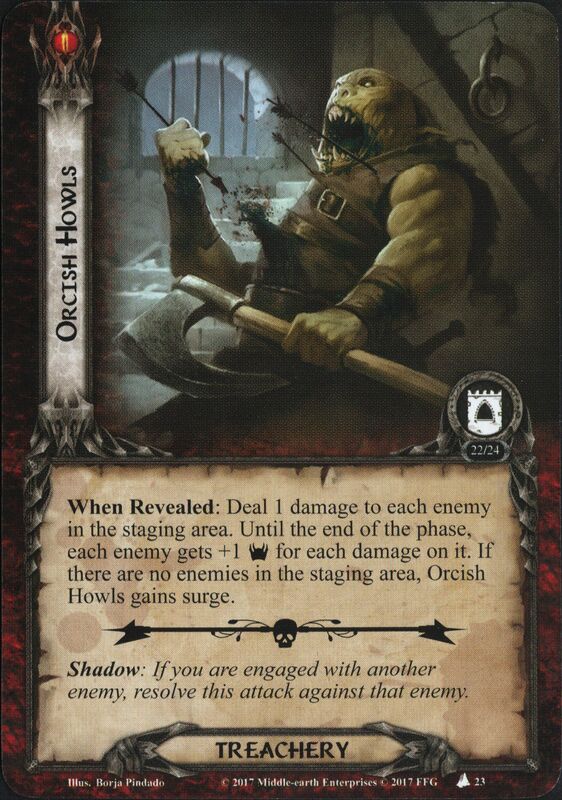 If there are no enemies in the staging area, Orcish Howls gains surge. Shadow: If you are engaged with another enemy, resolve this attack against that enemy. When Revealed: Each enemy and each location currently in the staging area gets +1 Threat until the end of the phase. If there are no cards in the staging area, Driven by Shadow gains surge. The first Scout enemy revealed from the encounter deck each round gains surge and doomed 2. When Revealed: Raise the total Threat of the staging area by 1 for each Scout enemy in play. If there are no Scout enemies in play, Dark Pursuit gains surge. When Revealed: The first player must choose: skip the next travel phase, or each player must pass his hand to the player on his left (discard your hand instead if you are the only player in the game). Midnight. Groping Horror gains surge. When Revealed: Choose a location in the victory display and return it to the staging area. If no location was returned to the staging area this way, Swaying Without Wind gains surge. When Revealed: Discard all resources in play. Each player raises his threat by 1 for each resource he discarded this way. If no resources were discarded this way, Chill Fog gains surge. Shadow: Raise your threat by 1 for each damage dealt by this attack. When Revealed: No more than 5 progress can be placed on the current quest this round. 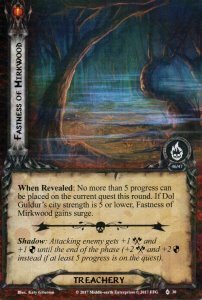 If Dol Guldur's city strength is 5 or lower, Fastness of Mirkwood gains surge. Shadow: Attacking enemy gets +1 Attack and +1 Defense until the end of the phase (+2 Attack and +2 Defense instead if at least 5 progress is on the quest). While there is a copy of Eastern Crows in the discard pile, Eastern Crows gains surge. When Revealed: Return each engaged enemy to the staging area. If no enemies were returned this way, Restless Hunters gains surge. Shadow: Attacking enemy gets +1 Attack. If this attack destroys a character, return attacking enemy to the staging area. When Revealed: If there is another Orc enemy in the staging area, Wolf Rider gains surge. 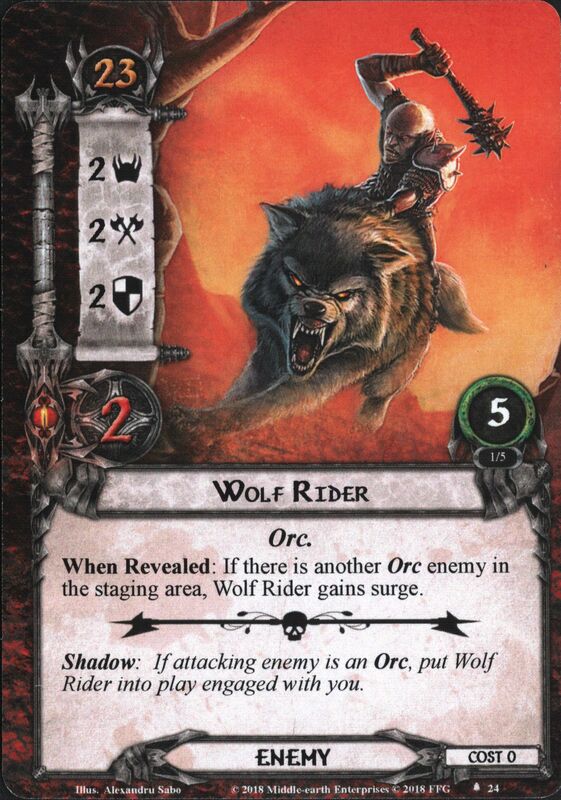 Shadow: If attacking enemy is an Orc, put Wolf Rider into play engaged with you. When Revealed: The opposing team attaches Driven by Shadow to an enemy and returns it to the staging area. (Counts as a Condition attachment with the text: "Limit 1 per enemy. Attached enemy gets +2 Threat, +2 Attack, +2 Defense and is immune to player card effects.") If there is no enemy in play, Driven by Shadow gains surge. 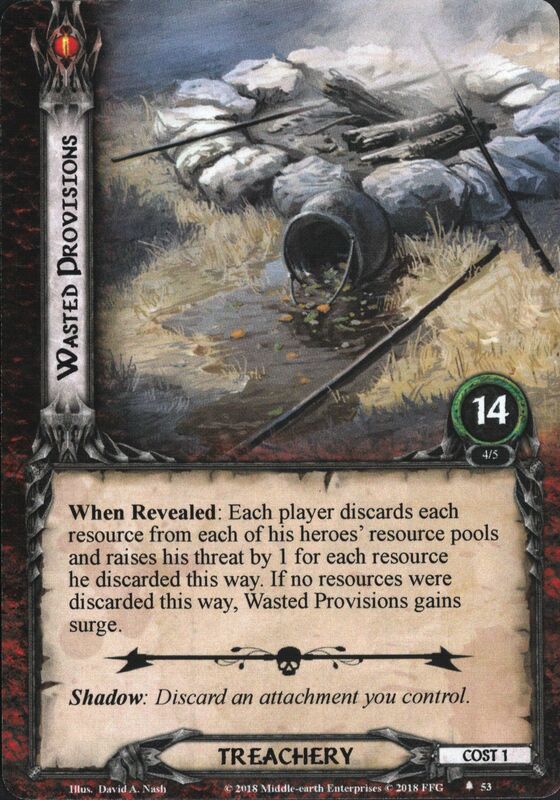 When Revealed: Each player discards each resource from each of his heroes' resource pools and raises his threat by 1 for each resource he discarded this way. If no resources were discarded this way, Wasted Provisions gains surge. If there is no Hill Troll in play, Anduin Troll Spawn gains surge. Forced: At the beginning of the combat phase, Anduin Troll Spawn engages a player engaged with a Hill Troll. When Revealed: All engaged Troll enemies attack. If no Troll enemies are engaged, Troll Attack gains surge. When Revealed: Remove all damage from all enemies. Then, each player raises his threat by the amount of just removed from his engaged enemies. If no damage is removed by this effect, Smoking Blood gains surge. 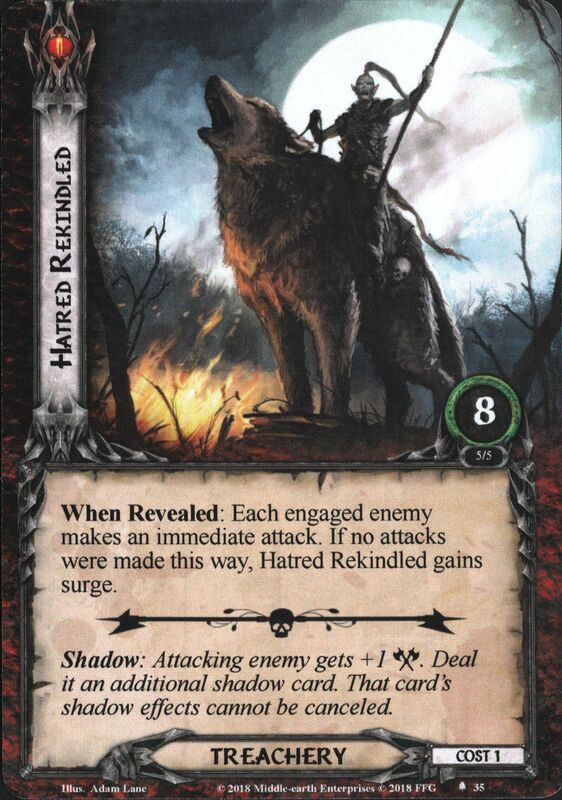 When Revealed: Search the encounter discard pile for a Clue card and attach it to a Mordor enemy in play, if able. 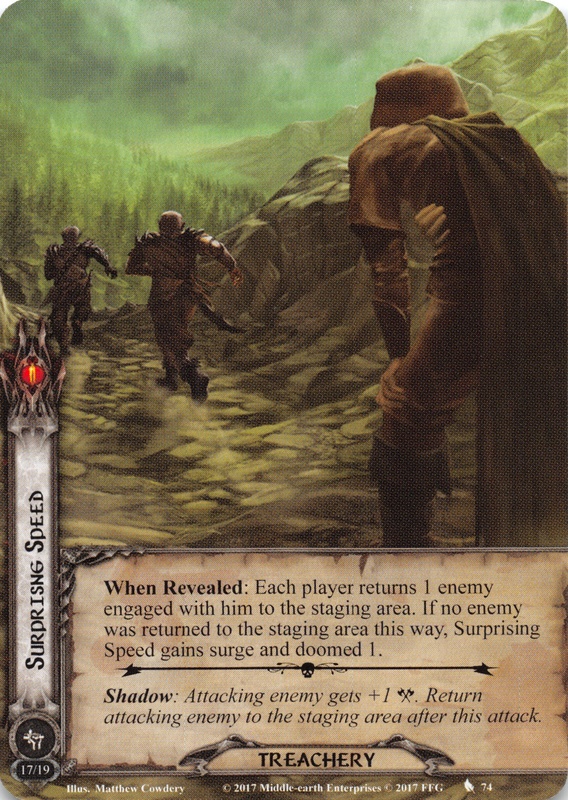 If no card is attached by this effect, The Enemy's Trail gains surge. 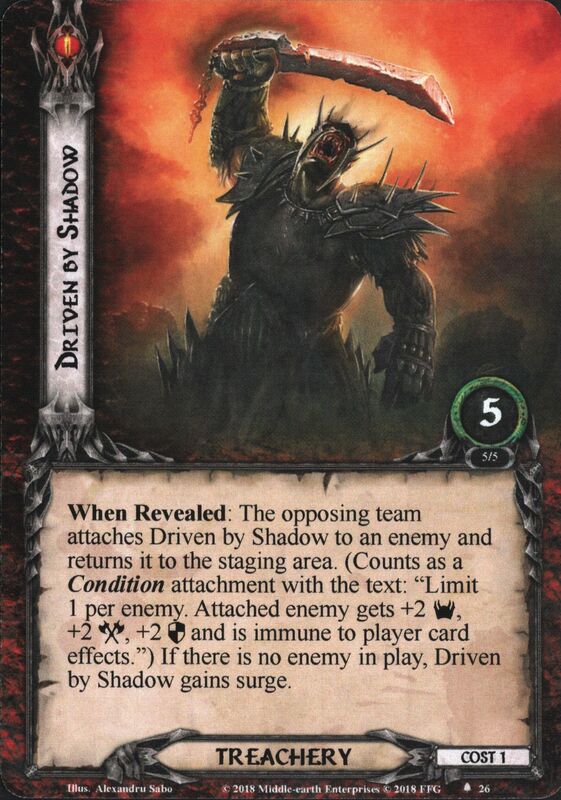 Shadow: Search the encounter discard pile for a Clue card and attach it to a Mordor enemy in play, if able. When Revealed: Discard all attachments controlled by the player guarding Gollum. Then remove all cards in that player's discard pile from the game. If no attachments are discarded as a result of this effect, Befouled Equipment gains surge. Shadow: Discard all attachments controlled by the player guarding Gollum. When Revealed: Return each engaged enemy with the ambush keyword to the staging area. Each player makes engagement checks against each enemy in the staging area, as if it were the encounter phase. If there are no enemies with the ambush keyword in play, Tumultuous Assault gains surge. When Revealed: Each player must either discard his hand, or raise his threat by the number of cards in his hand. If no cards were discarded by this effect, Chill of the Roots gains surge. 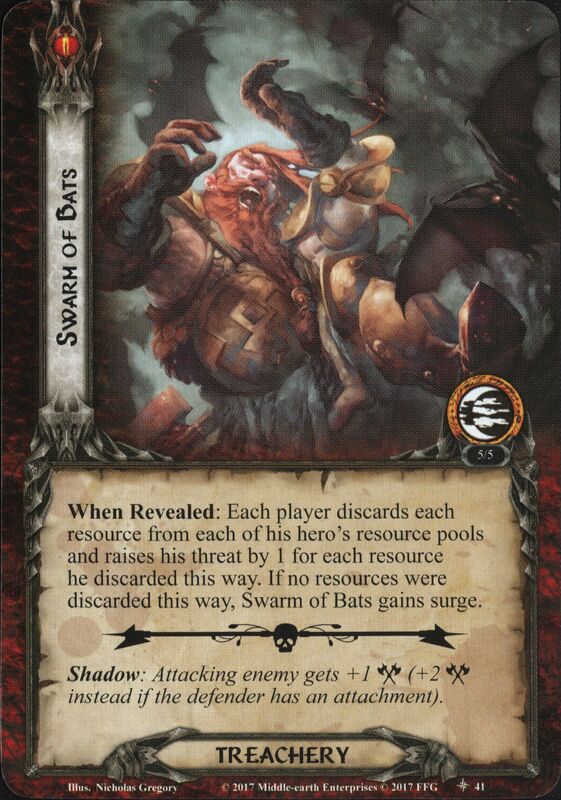 Shadow: If attacking enemy is Nameless, attach the top card of the defending player's deck to it. When Revealed: If the current quest has a keyword, until the end of the round, switch that keyword from battle to siege, or siege to battle, if able. If the current quest does not have a keyword, Savage Fray gains surge. 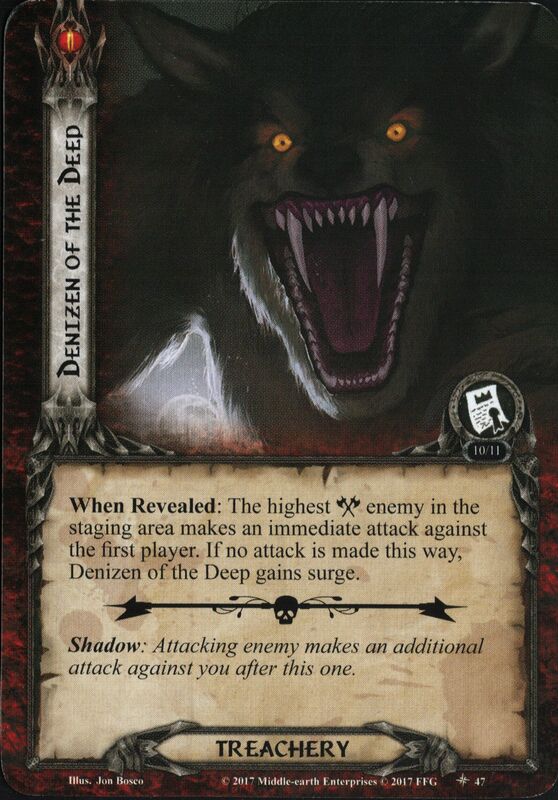 When Revealed: Each player must trigger the prowl keyword on each enemy engaged with him, as if that enemy had been revealed from the encounter deck. Then, return each engaged Wose enemy to the staging area. If no enemies are returned to the staging area by this effect, Drums of the Wild Men gains surge. When Revealed: Each player discard the top 3 cards of his out-of-play deck. Add each enemy discarded this way to the staging area. If no enemies are added to the staging area this way, Mugash's Cunning gains surge. Shadow: Attacking enemy gets +3 Attack and +3 Defense until the end of the round. While Dark Pathway is the active location, the first treachery card without the printed surge keyword revealed during the quest phase gains surge. Shadow: Either remove 1 time counter from the current quest or treat this attack as undefended. When Revealed: Deal 1 damage to each location in the staging area. Until the end of the phase, each damaged location gets +1 Threat. If there are no locations in the staging area, Hateful Search gains surge. When Revealed: Each player discards each card in his hand that has the same title as a card in his discard pile. 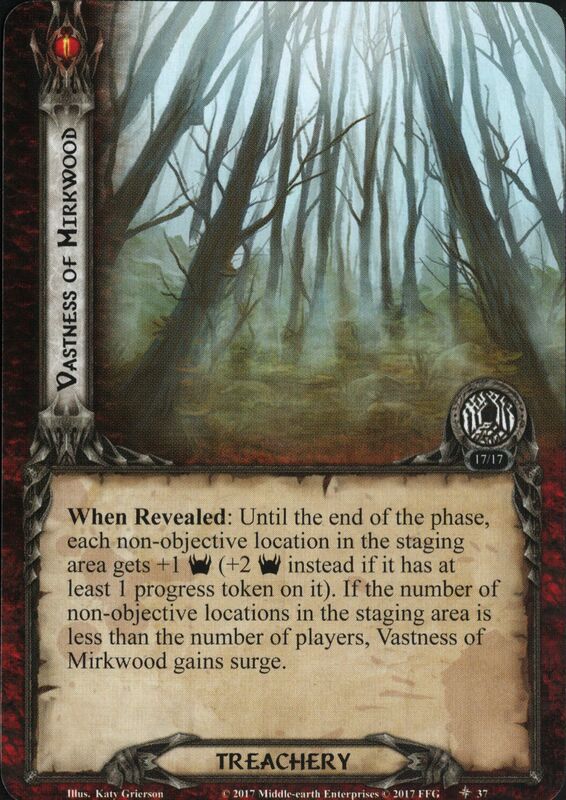 If no cards are discarded by this effect, Curse of Angmar gains surge. When Revealed: Discard the top 3 cards of each player's deck. Each player discards each attachment he controls that has the same title as a card in his discard pile. If no attachments are discarded from play by this effect, Death and Decay gains surge. Cannot have attachments. While you are off-course (Cloudy, Rainy, or Stormy), Tide-runner is considered to be in the Stormcaller's area and the staging area, regardless of its current location. When Revealed: Either choose a player to engage Tide-runner, or add Tide-runner to the Stormcaller's area and it gains surge. When Revealed: Until the end of the round, each Undead enemy gets +X Attack and +X Defense. X is the number of locations to the left of the active location (in its row). If X is 0 or 1, Call of the Curse gains surge. Shadow: Resolve the 'when revealed' effect of Call of the Curse. When Revealed: Each player assigns X damage among questing characters he controls, where X is the Threat of the active location. If there is no active location, Fire and Foul Fumes gains surge. Shadow: Assign X damage among characters you control. X is the Threat of the active location.